​​​​​MANSFIELD – The Dallas Stars, in partnership with the City of Mansfield, plan to begin work on a new city-owned Dr. Pepper StarCenter facility, which will be the latest regulation-sized ice rink to be developed in the region. The new 78,000-sf facility will have a dual-sheet ice rink, eight public locker rooms, three private locker rooms and three multi-purpose rooms to help assist upcoming young hockey players. Construction is slated to officially begin with a groundbreaking ceremony near Broad St. and SH 287 in late March 2017. 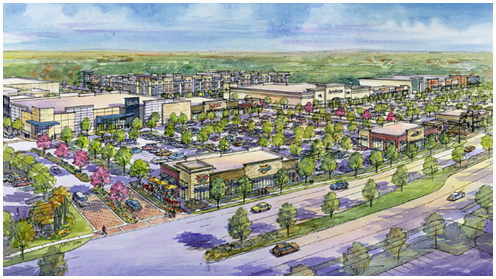 It will sit within the Shops at Broad, a planned retail destination in Mansfield. Mansfield is developing the $15.1 million ice rink which will be leased and operated by the Dallas Stars. It is part of a larger mixed-use development, which is being marketed as The Shops at Broad. The Shops at Broad are slated to open in 2018 and will bring about 430,000 sf of retail to Mansfield, according to CBRE. ​Want​ more data? See​ DFW Market Overview Research.